Do you know about "orikata", which has been around in Japan since long ago? "Orikata" is a way of wrapping Japanese paper when giving a present. Now in Japan, the amount of people who know about "orikata" is very small I, too, just recently learned about it. Everyone, why don't you try the traditional Japanese way of wrapping as well? This is an "orikata" for wrapping a calligraphy brush. 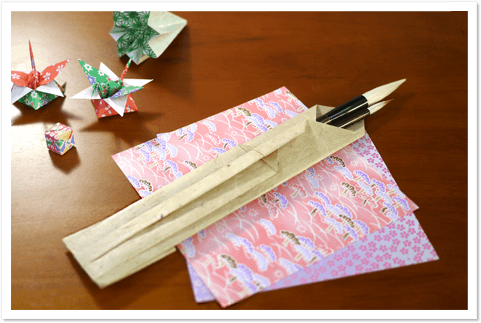 Also, it's beautiful for wrapping pencils or other stationary, or chopsticks! 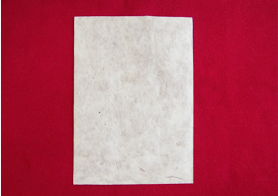 Prepare a piece of A4 Japanese paper.If you don't have Japanese paper, any kind of paper will do. For people who aren't familiar with orikata, please use the practice template below. Point! Don't align the folds.